I've said it before - last week - and I'm going to say it again. Oh crochet! How I am learning to love you. I was going to save a photo of my blanket until it was (at least nearly) finished, and ready for its place at the end of the bed; but you have asked for it, so here it is. In the kitchen instead. It's heading for the bedroom of a teenager who reckons a big injection of bright blue would make her pink and cream scheme look a lot more grown up. I think she's right, so we've been looking round for some new bits and pieces. Just last night we realised this might be exactly the excuse we need to take a trip to Ikea for a turquoise trolley (cos we bought a grey one last time, but who doesn't love a bit of blue enamel? We just have to break it to her dad). It's easier to rip it out and pick it back up than it is with knitting. Big plus when you are a beginner. The more colour you add, the better it looks. And changing colour is very satisfying. I go faster when it's one I really like. The turquoise is my speed shade here. It's a pretty cheap crafting fix. I'm using the Stylecraft DK recommended by Lucy at Attic24 - big 100g balls for under £2 each. They go a long way (especially if you drop them as you are carrying the whole thing downstairs to take a picture..). I bought from Wool Warehouse and from a gorgeous new UK place I have found: The Homemakery. This is the yarn shop for scrapbookers! Yes, they have wool, but they also have twine, velvet ribbon, acrylic stamps, washi tape AND felt, gingham, linen, Tilda fabrics. They had me at library cards. But I might also have bought a doily stamp and some needles for sewing wool. Wool, fabric and paper all in one place? What's not to love? Their blog is here. It's an excuse for a new Pinterest board. I've started one called Now I Love Crochet. But if I'm pinning, I'm not hooking. And at the minute, hooking is making me happy. Anyone else try a new craft lately? it is no wonder you are loving it - such happy colors to work with! 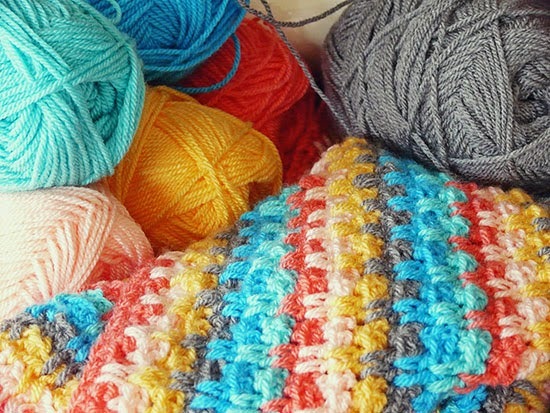 You are making me very envious...how I would love to be able to crochet....and your colours are such happy,fun ones. it looks gorgeous, I must get my hook out again! What is it about crochet? Your blanket already looks wonderful, my sister is a crochet addict (to the detriment of scrapbooking) and Lucy from Attic 24 lives in a crochet show home!! Beautiful work - can't wait to see the finished product! I love crocheting and I am a beginner too. LOVE the colors in the afghan you are making, Sian. 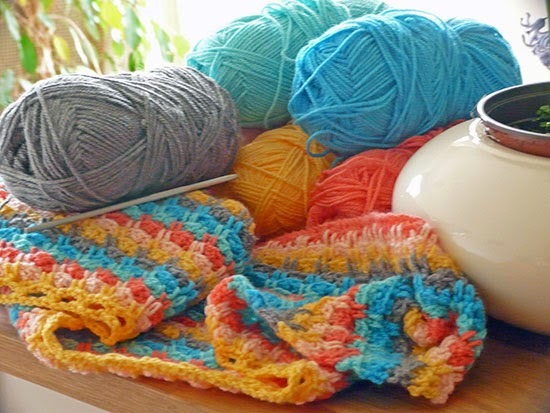 I have "crochet an afghan" on my crafting bucket list this year! Can't wait to see your completed piece! Love the bright colors and the stitch pattens! Yarn also goes a long way if say a curious young cat knocks it to the floor and then chases it when you get up to get another glass of wine. That turquoise trolley is what I was saving for before I inherited Craig's trolley. Yes. You should both definitely buy it. Let me spend through other people :D The colours of that blanket are gorgeous - her room will look amazing! Haven't tried a new craft but did do gilding for the first time the other day. Addicted I is. Just have to wait for another non-windy day to play with it in my shed again as, much like glitter, it's banished from the house. A gorgeous collection of colours - and love the grey in here (always my go-to). This is going to be just beautiful when it's completed. It's so exciting to have a new love. I am impressed with your new talent... I have tried to teach myself but have yet to get as far as you. Loving the colours and I will be checking out the Homemarkery. Just the name makes me want go look! Look forward to seeing the finished article and you have made me want to dig my crochet attempts out and have another go. I just gave away most of the yarn I had hoarded. I don't think I'll get back to knitting, and I've never learned to crochet. But, wow, I LOVE your blanket--the stitches, but especially the gorgeous colors. I'm pinning it for the colors---they might show up in a card. What fabulous bright and cheery colours especially on a dull morning here. I have started to sew stuffed dogs! and it is bunting season again. Ive got the sewing bee bug. Awesome colours! Have fun hunting for bits and pieces. This is looking beautiful. I haven't tried a new craft but have taken up knitting again which I am really enjoying. Great colours. It's going to be a beautiful blanket. I love to visit Lucy's blog and admire all her wonderful work. I've just bought one of those trolleys too. I love the turquoise, but went for the grey in the end. Not a new craft exactly, but a revisited one. Still trying to get my head back round dressmaking! Hello Sian, I have just realised it's been a very long time since I've left a comment here, so I'm going to do a comment catch up again, sorry they come in such bursts! It's looking lovely Sian and I love the colour combinations you've used. Oh my, I haven't crocheted in a long time. I might just have to get out some books and look for something to do. Oh this is so beautiful! So exciting that you have found a new craft to love. That's what I love about granny squares, when I make a mistake, it is so easy to rip back and not have to pick up live stitches like in knitting! I agree that the turquoise trolly is a must! Such fantastically happy colors for an afghan!! And the "yarn store for scrapbookers" sounds like a place I'd like to stroll through myself! Your afghan is gorgeous! Crocheting is the first needle art I took up in 1971. My mother always crocheted. I watched her teach someone, went home and taught myself. As you said, it's easier to fix than knitting and faster. Currently, I taught myself to make some crocheted hearts that I plan to include in my scrapbook club kits. Can't wait to see your afghan when it is finished in the room with the turquoise "trolley" (which I'm gather is a rolling cart with drawers). I just love those colours!!! I really really don't want to start crecheting because I know I will get addicted and spends loads on wool that ends up sitting in a box calling my name!